Hurricane Florence is accelerating into an "extremely dangerous" storm that is expected to pummel the Carolina coast later this week as U.S. officials prep for the first category four event to hit the mid-Atlantic area in more than sixty years. Heed the warnings, FEMA says. "The preparedness time is getting close to being over," warned Charley English, the American Red Cross national emergency management liaison on a conference call with press Wednesday afternoon. "It is time to act." As of Wednesday afternoon, Florence had weakened slightly to a category three hurricane. Due to the storm changing course, the governor of Georgia declared a state of emergency. Jeff Byard, associate administrator for FEMA's Office of Response and Recovery, told TheStreet that he didn't know how much the hurricane could cost in damages once it makes landfall. "I wish we could figure that out before the storm, it would be nice," said Byard. "The damage to the infrastructure is going to be what it's going to be. We are prepared to support our states and our locals in the rebuilding effort and the cost, but it will be what it'll be. We have adequate resources to fulfill the needs." Byard also warned that he believes the hurricane will once again become a category four before it makes landfall. 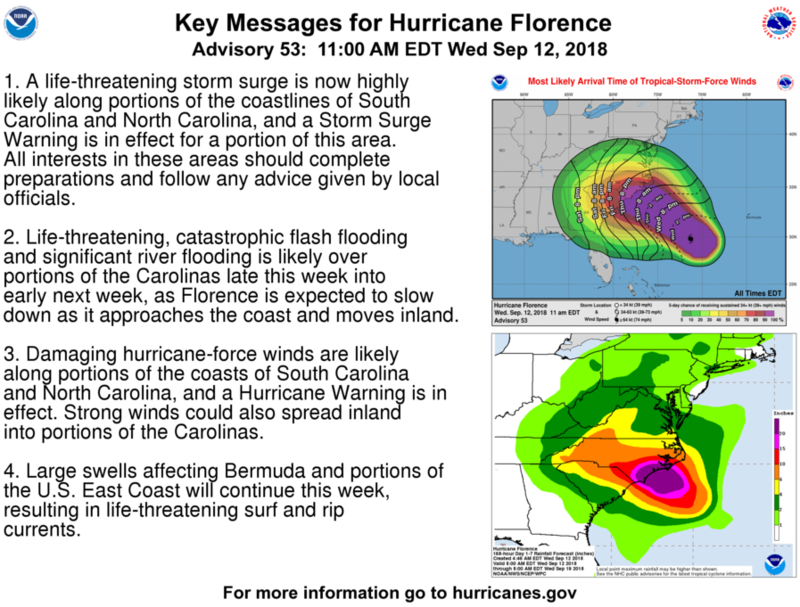 At 11 AM, the National Hurricane Center put out an update about the hurricane, saying that the storm has moved more towards North and South Carolina. It will potentially impact Georgia as well if it stays on the current course. Hurricane Florence is accelerating into an "extremely dangerous" storm that is expected to pummel the Carolina coast later this week, according to the NHC, as U.S. officials prep for the first category four event to hit the mid-Atlantic area in more than 60 years. Florence is now positioned some 530 miles southeast of North Carolina's Cape Fear, the NHC estimates, with current windspeeds as high as 130 miles an hour as it barrels towards its anticipated Friday landfall. Storm winds as high as 75 miles per hour could extend as far as 175 miles from the storm's center, the NHC said, a range that stretches Florence's impact from Charleston, South Carolina to the southern coast of Virginia. To put the size of Florence in context, it's bigger than the state of Michigan. The European Space Agency had to use a wide-angle lens to take pictures of Hurricane Florence from the International Space Station. "Florence is a category 4 hurricane on the Saffir-Simpson Hurricane Wind Scale. Strengthening is forecast through tonight," the NHC said Wednesday. "While some weakening is expected on Thursday, Florence is forecast to be an extremely dangerous major hurricane when it nears the U.S. coast." In a press conference on Wednesday, Sept. 12, Steve Goldstein, NHS's FEMA liaison, said that there is a possibility that Hurricane Florence could stall once it reaches land, meaning that "parts of North and South Carolina could experience hurricane force winds and rain for 24 hours." Byard warned that residents should evacuate. Tuesday "is the last good day to leave," he said. North Carolina Governor Roy Cooper has called the storm a "monster" and warned of "days and days of rain" as governors in three coastal states ordered the mandatory evacuation of around one million residents. If Florence makes landfall with its current windspeed, it will be the first category four storm since Hurricane Hazel in 1954. President Donald Trump, who signed orders earlier this week declaring states of emergency for both North and South Carolina, insisted the Federal Emergency Management Agency, or FEMA, was "absolutely, totally prepared" for Hurricane Florence and that his administration has "spared no expense in its preparations." Hurricane Categories: What Is the Saffir-Simpson Scale? "We're ready. FEMA is ready. Everybody is ready," Trump said, although his remarks drew criticism when he praised the agency's reaction to Hurricane Maria, which devastated the U.S. territory of Puerto Rico last year, killing as many as 3,000 people, while suggesting the island had "had no electricity, essentially, before the storm." The NHC expects Florence to bring a storm surge that could reach as high as 13 feet "along the immediate coast in areas of onshore winds, where the surge will be accompanied by large and destructive waves." "As far as storm surge in North Carolina, the Pamlico sound, Pamlico River may experience a nine to 13 foot storm surge, especially around the time of high astronomical tides. Also of concern is the Wilmington area and surrounding beaches. There will be an extreme inland flooding threat once Florence moves inland...we expect five to 10 inches with upwards of 20 inches and heavier rain [as it moves into South Carolina]," said Goldstein. "Surge-related flooding depends on the relative timing of the surge and the tidal cycle, and can vary greatly over short distances," the NHC said.